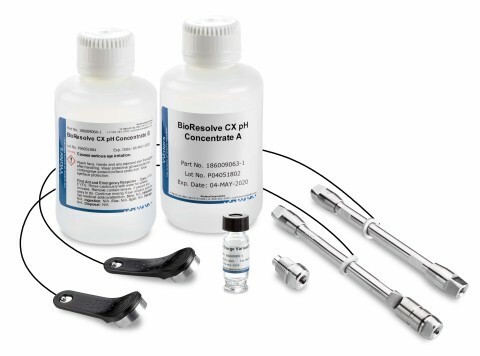 Waters Corporation has introduced a new cation exchange column line with specialized consumables to simplify and improve the characterization and monitoring of monoclonal antibody (mAb) therapeutics. The newBioResolve™ SCX mAb Columns and Vanguard™ FIT Cartridge technologies, together with a suite of complementary consumables, enable mAb charge-variant analyses as required by the World Health Organization, the U.S. Food and Drug Administration, and the International Conference on Harmonization for confirming the efficacy and safety of biologics and biosimilars within discovery, development, and manufacturing applications. The columns are also available with a first–of-its-kind Vanguard Fully Integrated Technology (FIT) Cartridge which prevents particulates and other contaminants from being carried onto the column thereby extending its working life and reducing the cost-per-analysis without compromising the quality of the separation. Each batch of material for the BioResolve SCX mAb columns and VanGuard FIT cartridges are specifically quality control-tested with a new and commercially-available mAb charge variant standard derived from the National Institute of Science and Technology Reference Material 8671 (i.e. humanized IgG1κ) to help ensure batch-to-batch consistency of the new offering. When used with Waters liquid chromatography systems equipped withAuto•Blend™ PLUStechnology, scientists can take advantage of pre-configuredEmpower™ softwaremethods and automatically blend up to four solvents in any combination or proportion and program in pH and ionic strength. This significantly reduces human error and eliminates the task of preparing buffered mobile phases manually. Waters has also specifically formulated new BioResolve SCX pH buffer concentrates with recommended gradient separation conditions for those scientists looking for a “turnkey” solution for mAb charge variant analyses.